Iran are chasing a record-equaling fourth Asian Cup title, but renowned coach Carlos Queiroz is adamant the only match that matters is the opening one against Yemen. Team Melli won an unprecedented three tournaments in a row between 1968 and 1976 – they are joint second for most titles lifted with Saudi Arabia – but have not hoisted the continental crown since that last home soil triumph 43 years ago. 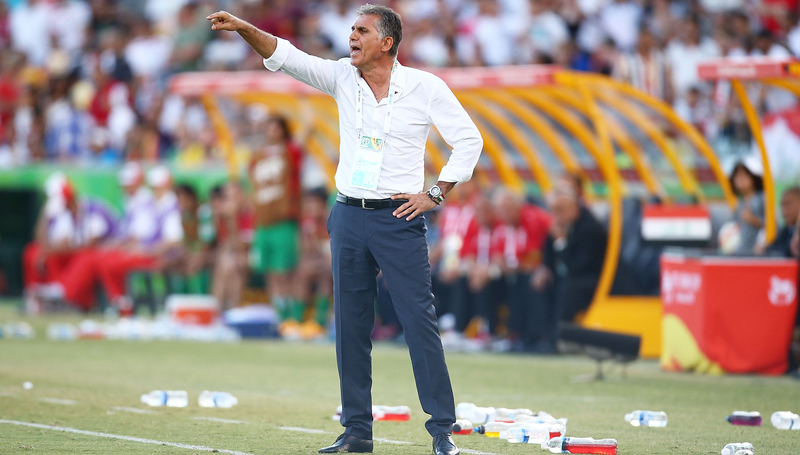 Former Manchester United assistant coach Queiroz has been in charge of Iran for eight years and his side come into the tournament as one of the favourites – but after seeing Jordan upset holders Australia 1-0 in Al Ain on Sunday, the Portuguese is not getting carried away with that tag. “This is football. You cannot play a football game with a credit card of being favourites. If you don’t play good football, you don’t deserve to win,” said Queiroz, who led Iran at the 2014 and 2018 World Cups. “We came here to play good games and we have to if we want to defeat any team. Yemen are a good side and we have to respect them. Yemen are at the other end of the scale in terms of tournament pedigree. They are making their Asia Cup bow and head coach Jan Kocian says his team are eager to get going against one of Asia’s heavyweights. “The world knows Iran. They had a great World Cup and in Carlos Queiroz, one of the best coaches in the world. We are, however, not going to let that get to us,” said the former Czech Republic international. Another world famous manager appearing in the UAE this month is Italy’s 2006 World Cup-winning coach Marcello Lippi, although he has rather smaller ambitions in terms of what he hopes his China team can achieve. They were runners-up in 1984 and 2004 yet Lippi hopes China can be a surprise package at the Asian Cup. “We know that in a competition like this there are favourites like (South) Korea, Japan, Iran and Australia, but in this kind of competition you always have a surprise team,” said the 70-year-old former Juventus and Inter Milan boss. 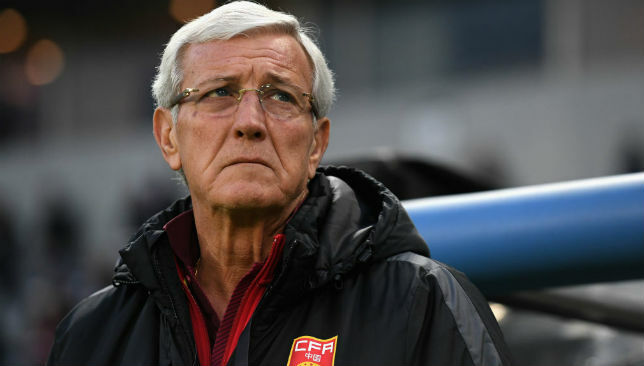 Lippi hopes China will be a surprise package in the UAE. China, ranked 76th in the world, are favourites to beat Central Asian minnows Kyrgyzstan at Al Ain’s Zayed bin Khalifa Stadium on Monday, but captain Zheng Zhi is suspended with Lippi revealing forwards Wei Shihao and Xiao Zhi are missing through injury. Like Yemen, Kyrgyzstan are making their first Asian Cup appearance but coach Aleksandr Krestinin believes that while his side will be underdogs, he reminded critics the match will be won and lost on the pitch. “Obviously China has a very experienced coach who is a world champion, but he was not the world champion with China,” said the Russian tactician. Defending champions Australia made their worst ever start to an Asian Cup on Sunday when underdogs Jordan pulled off a shock 1-0 victory in front of a partisan crowd in Al Ain. Graham Arnold’s youthful side – shorn of Aaron Mooy and Daniel Arzani through injury – were hot favourites to triumph in the Group B-opener at Hazza bin Zayed Stadiun, but they were undone by Al Faisaly centre-back Anas Bani-Yaseen’s powerful first-half header from a corner. After the interval, FC Midtjylland winger Awer Mebil rocked the upright with a shot and Perth Glory forward Chris Ikonomidis had a header scrambled off the line as Arnold’s men tried in vain to level. The result leaves the injury-hit Aussies with much to ponder ahead of Friday’s clash against Palestine, when they will need a win to get their defence on track. For Jordan, they next meet dark horses Syria on Thursday. 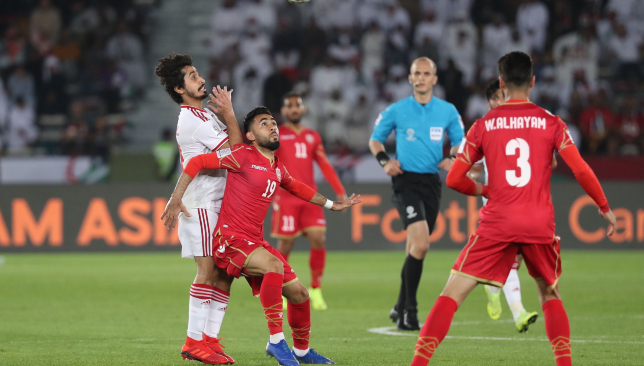 Substitute Ahmed Khalil, on his 100th cap, netted an 88th-minute penalty kick to save hosts UAE from a losing start to the 2019 Asian Cup against Bahrain. After a first half of very few chances on Sunday at Zayed Sports City, stand-in striker Mohamed Al Romaihi lashed in at the second attempt on 78 minutes. A shameful Group A- opening appeared to be on, before replacement Mohamed Marhoon’s handball was harshly punished and Khalil did the rest to earn an unsettling 1-1 draw. After several seasons to forget, a moment of joy for Khalil – and the grateful UAE. The 2015 AFC Player of the Year has scored just five Arabian Gulf League goals since summer 2017’s failed free transfer to Al Jazira. But the Whites kept faith in a player struggling, badly, for form and fitness. Under-pressure coach Alberto Zaccheroni turned to him, instead of veteran Ismail Matar. A calm penalty straight down the middle justified this call. Head coach Miroslav Soukup’s rebuilding job moved a few steps forward on Saturday night in Abu Dhabi. A three-match winless run coming into this match showed the value of the youth football expert’s work, but this draw handed validation to the Czech’s revolution. Progression to the knockouts for the first time since 2004 is an attainable goal. Well, no-one connected to the UAE camp can credibly argue this wasn’t predictable. Denied a precious early breakthrough because of Shabab Al Ahli Dubai Club winger Ismail Al Hammadi’s errant effort, a stodgy remainder of the match was played out. Ali Mabkhout’s glaring miss came from a poorly defended corner and the leveller was incredibly fortunate. For their previous 18 matches, Bahrain had not kept a clean sheet at the Asian Cup. A 19th should have followed. The statistics for Zaccheroni’s grim reign now reads: six wins, eight losses, five draws. Top spot is anything but assured. What could have been with Helal? This was the injury that Bahrain most feared. Brand-new Slavia Prague signing Abdulla Yusuf Helal – in a move that should be food for thought for UAE opposite number Ali Mabkhout – missed out on the starting XI because of injury in the final, and promising, 4-0 friendly beating of North Korea. Replacement Al Romaihi scored the opener and impressed. Greedy maybe, but imagine what the usual starting No9 would have done to the uncertain hosts? 6th min CHANCE: Al Hammadi turns on the afterburners and charges into the penalty box, but his miscued shot curls agonisingly wide. 44th min CHANCE: Hearts are in mouths from the home crowd as Al Riffa midfielder Komail Al Aswad appears to pick out a perfect free-kick. But his effort just floats over from 20 yards. 53rd min CHANCE: Ali Madan unleashes a swerving shot from 30 yards that Club World Cup hero Khalid Essa spills to Al Romaihi, but he redeems himself with a block. 68th min CHANCE: The ball spins to 2015 Asian Cup top scorer Ali Mabkhout. Yet somehow, the predator drags his shot wide. Unbelievable. 78th min GOAL: Right-back Sayed Redha Isa floats in a cross that Al Romaihi first hits the woodwork off, via Khalifa Mubarak, and then slots in the opener. Stunning. 88th min PENALTY: There is confusion around the ground when the Jordanian referee points to the penalty spot. A harsh handball is punished by Khalil. 1-1. Of all the things Zaccheroni can be accused of, it can’t be said he wasn’t aware of his failings. A trio of defensively minded midfielders in Khamis Esmail (oddly stationed on the right flank), Ali Salmeen and Amer Abdulrahman did not help the situation. Neither the confused role of playmaker/winger Khalfan Mubarak in a 4-4-1-1. The ex-AC Milan, Juventus and Japan supremo would turn to his bench before the hour mark and bring on link-man Mohamed Abdulrahman and winger Saif Rashed. Fellow replacement Khalil would come up with the goods from the penalty spot. Plenty to ponder with India next up on Thursday. The phrase ‘must do better’ defined this soporific opener from the hosts. Mabkhout had little to feed on, and when a chance arose, he snatched at it. Boss Zaccheroni has much work still to do. Damningly for the UAE, Bahrain did not have to be outstanding to come away with a point. They defended well through the likes of Sayed Dhiya Saeed and stand-in striker Al Romaihi did the business.